About the same time, I got some solid every day (porcelain) white dishes. These, but just the dinner plates. I never used them. Instead, I have only used the Kate Spade, every single day for at least five years now. 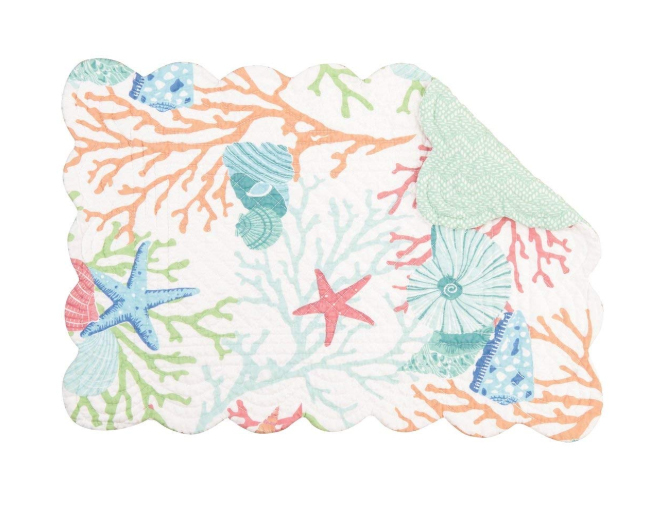 With solid turquoise blue quilted place mats and matching napkins. (Or navy ones, during the winter.) Yes, I love the pattern; they are GORGEOUS dishes. But…. So I got a hair up my #$)*$ this week that I would put away the Kate Spade’s, at least for the rest of the summer, and just use the whites. 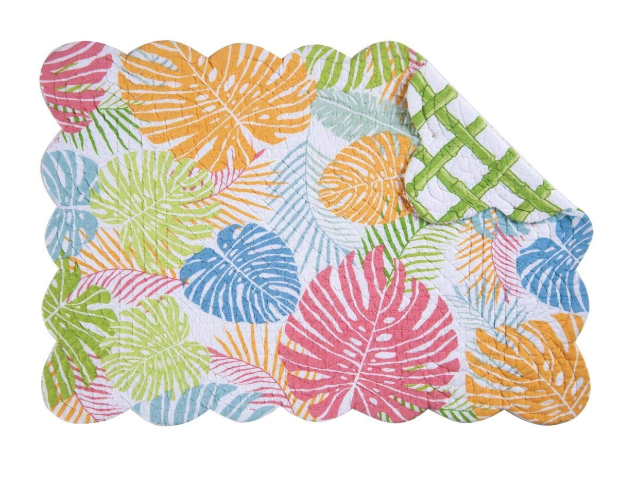 I would get NEW quilted place mats, and NEW cloth napkins, and enjoy those for the summer. I can’t wait for them to all arrive! I should have in the next day or two. I’m SET. It’s all very exciting! How are YOU about dishes? 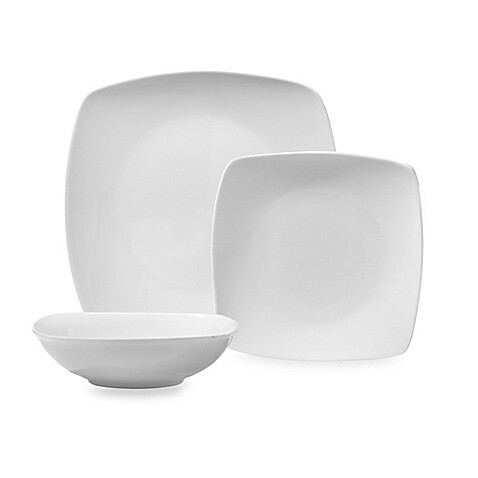 What types (every day china, melamine, stoneware) of dishes do you use? Anyhow, I’m bored. Time for a switch up. Very exciting! 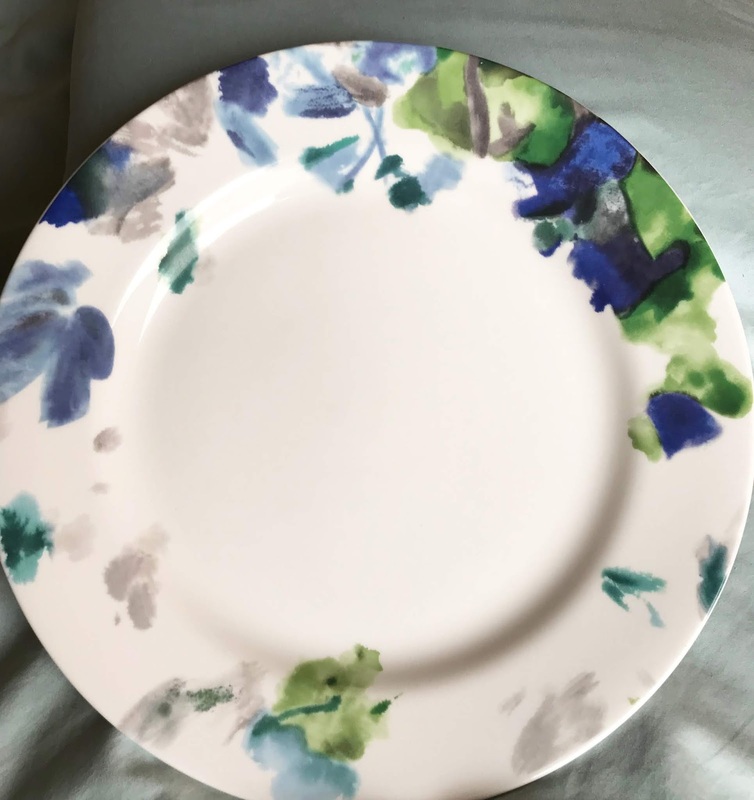 This entry was posted in Uncategorized and tagged china, dishes, Kate Spade, place mats on June 28, 2018 by Silver Willow. Oh you hit on a subject here that is near and dear to my heart. Before I moved to a smaller place four years ago, I had 14 different sets of dishes. Imagine that!! Now I'm down to 7 sets and thankfully, I've been able to control the urge to buy another pretty set since then. Now, here's the really crazy thing, I'm single and always have been. However, I did entertain a lot. I don't do quite as much these days but, I do love to cook and cooking for other people is more fun than cooking for one. It’s fun to mix it up even when we love something. When I moved to 800sq ft I decided to simplify. White dishes and serving only. I Alice it up with placmats or chargers or whatever. Exactly! I've always wanted to do the 'white dishes' but dress it up otherwise….finally am. But I love those Kate dishes and they will always have a place in my life, especially now with her untimely demise. Goodness, I am going to let the side down here, my collection is – eclectic, perhaps. For entertaining I have a big dinner service which is about 60 years old, white, dark burgundy and 22k gold trim – sounds very exotic and it is. It belonged to my parents and they bought it when they lived in Hong Kong, way back. That set is too special for anything other than special family times or dinner parties, but I do use it because I am way too sentimental not to, if you know what I mean. Everyday dishes are sometimes mismatched and bought on a whim, or when my dish-washer breaks something. I also have a set of dinner plates which I inherited from my aunt, they are white with very funky stylised Highland cattle (1970's style) in the middle – sounds awful, but my grandchildren adore using them. I have a drawer-full of old linen tablecloths, but we generally have an 'oilskin' tablecloth on the kitchen table topped with tablemats for under plates and dishes. Elaine, that all sounds wonderful! Some day, do one (or more) posts about them, with pictures! I'd love to see them all! I like the shape of those square dishes – I had dishes in that shape at one time – my husband and I painted them ourselves at one of those pottery painting places. And the Kate Spade dishes are very pretty…I always thought it would be fun to have all mismatched dishes and flatware – just odd pieces that I liked accumulated over time, acquired from “junk' stores – but while the idea of that was appealing the effort to do it wasn't. when I married the first time I got china which we never used. when I married the second time I didn't get anything but later I inherited my maternal aunt's china which sits in a box. after the kids grew up and moved away we started using the china from the first marriage for everyday and I begged a place setting from as many family members as would give me one which we use for fancy, which is not that often, every person with a different china pattern. and cloth napkins! which reminds me, I need some new ones and new place mats. we have two sets of good chine which we don't really use. We should just use them for everyday use as no one wants that kind of dinnerware anymore. Or not most people anyway. I have two sets of dishes, both antique and both can be used together. The one I used every day are old diner dishes—heavy, practically unbreakable and plain with just a ring of green on the edge. My better dishes have lily-of-the-valley and a green and with basket weave pattern. What woman doesn't like dishes? I have a small kitchen and just one set of white porcelain plates. One set of placemats and one set of cutlery. I'm pretty minimalistic when it comes to crockery and like to eat of a plain plate. 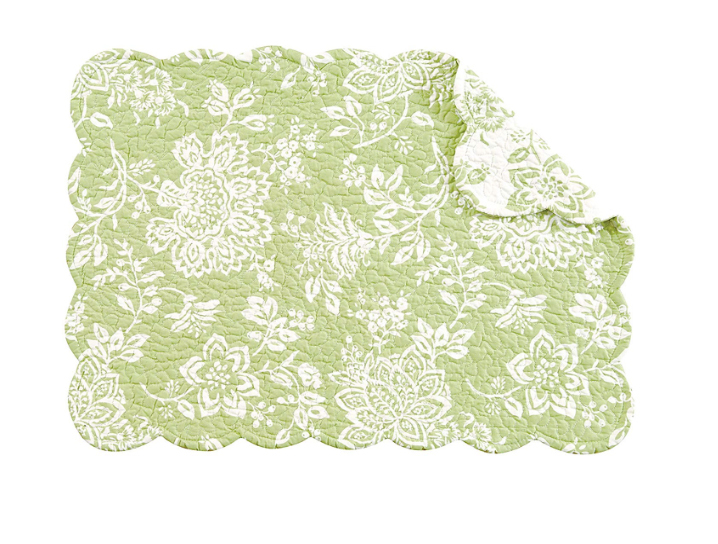 Your's all look lovely though and the white on those summery placemats will look really great!! Tablecloth, napkins, fancy china and crystal for the holidays, guests etc. Everyday meals for the two of us or the kids drop by, it’s placemats and paper. I use my mothers china cups and saucers to have tea parties with our granddaughters. May as well enjoy them and the girls love it when we do. Exactly, Happy! Every day is special! Love the first set of placemats but not my colors. When we downsized I thought I'd bring the good china service for 12. Then thought, I'm never going to be cooking for that many because all we can fit comfortably is 6 at the table. So opted for square white plates that are on the small size. I've since added round ones because discovered when daughter and her family came and we had multiply meals here we ran out of dishes. I use placemats on a regular basis then get tired of them and pull out the table cloth. I love your white dishes! The shape is so elegant. But then I'm a white plate person all the way because I like my food on a neutral background. If I want pretty, I have a bunch of mismatched vintage salad plates, each one a unique treasure, that look pretty used with the white plates. I also have a collection of cloth napkins in a variety of quiet colors. It's fun to switch things up a bit sometimes. We use place mats all the time. A tablecloth is only used when we have big gatherings. No fancy dishes on our end. I've actually never had a set! I have many dinner sets – oh my, 5 to be exact – 3 of my own and two of my late mothers.Three are Noritake, then china ones, all white is one, the other is willow pattern which is wearing very well. Can't stand chips so anything with a chip gets tossed, but fortunately only one piece out of the 5 has been chipped.No tablecloth these days, just solid place-mats which can be wiped or scrubbed.Serviettes we call them, often paper ones if not white linen ones.When visitors come they use what we use. Sounds good, Marcia! Thanks for sharing! One can never go wrong (in my book) with white and aqua! Nice! I'm struggling with the new napkins I bought; they are too, well, they feel too non-absorbent. I think it's the partial linen in them. Haven't used them, just felt them. Think I might return them and get pure cotton. A little more wrinkly, but I prefer the feel. Hey whatever works for you…cool! I found that 'fancy' dishes looked better longer, and actually break/chip less. But that's just me! I love Noritake; that's my brand of super fine china that I have the pattern of twelve in that were my daughter's set. So pretty.I don't like chipped either; lucky these every day china sets are pretty impervious to that! I have my mother's china. I have my daughter's first set of every day dishes. I have place mats that my mother wove. I use paper plates and paper bowls. Love your white set for showing off the meal. Me?? I just use paper and yep, most of my company gets the same. Bad Patti.